Savor the Sweet Potato: Best New Recipe! Oh people. Have I got a gift for you! If you are looking for a super-squeaky-clean, healthy, low-cal, heart-healthy, anti-inflammatory, DELICIOUS alternative to bread, chips, tortillas...I've got you! I stumbled across this recipe on facebook, and could not believe that three ingredients could create what I saw in the picture, so I tried it. It works. And it works in so many ways! Roll these babies out thin and you've got a crepe. So delicious with bananas and syrup, or a vegan nutella - or anything you can throw at it basically. Roll it out slightly thicker and you've got a tortilla. The yummiest wrap in the world! Fill it with anything from beans and avocados to salsa and tofu scramble, to cashew pimento cream cheese to....again, anything! Roll it out a little thicker and you've got bread. Delicious for dunking in this amazing soup I'm also going to show you, or honestly I like them plain! I've been making these babies for three days straight. They are the kind of thing that is easy to make in a trice, and that tastes good any time of day! And of course sweet potatoes are uber-good for you! they are chock-full of vitamin A (in the form of beta-carotene). They are also a very good source of vitamin C, manganese, copper,pantothenic acid and vitamin B6. Additionally, they are a good source of potassium, dietary fiber, niacin, vitamin B1, vitamin B2 and phosphorus. I mean come on! Can bread say that? Chips? Crepes? Main non! It really is the little things in life!!! Directions: Cut up onion in to large chunks, halve the red bell peppers, and peel garlic. Put on a cookie sheet or in a roasting pan and lightly drizzle with olive oil, and sprinkle with salt and pepper. Roast at 410 degrees for approximately 40 minutes - checking to turn or possibly to remove garlic if it gets too browned - until bell peppers are soft. Put peppers in a paper bag for 15 minutes until they cool down just a bit, then peel off the skins. Put roasted vegetables into a soup pot with broth and heat. Use an immersion blender, or transfer to a blender to puree. Add 1/4 soy creamer and mix. Heat through and serve with fresh basil garnish. Hello all, it's another gorgeous summer day in Portland! A cool, fresh morning with a slight marine haze that reminds me of the early Santa Monica mornings of my youth. Then the haze burns off and the day is fresh and golden - until it gets too hot for poor little Oregonian me and I retreat into the house until dusk. But these early mornings are incredible!!! The stuff that you dream of in the deep of winter. Because I am still pretty limited by back pain, I mostly stick around the house, with brief forays into the world a couple of times a week. This means many, many days and hours stuck in a very small house with a very small yard. In order not to go COMPLETELY INSANE I have to totally re-prioritize my expectations, and focus on different things than I would normally do. I've blogged about this in the past, I've called it "going small" - when your world is suddenly severely reduced because of an accident, or some unforeseen issue. It could even be someone else's issue or accident, but perhaps you have to be a caretaker for them - perhaps for a child or grandchild, or an elderly parent - and your daily world - both external and internal - suddenly shrinks to a shadow of its former self. What to do? I have decided that I must take this time to CREATE the world I want to live in. I have to take control of my thoughts and of the world I still control - or I will get depressed, and be even more immobilized. And really, being "forced" to think this way is a gift, a bittersweet one to be sure, but most gifts are. Because i can't go out and find the world I want to live in - I have to make it here, where I am. In order to that I like to think hard about what things have made me most happy in my life so far. I like to think about I loved when I was a kid - you know that bubbly feeling of joy and excitement you felt as a kid sometimes? It could be from anything - beloved pets, best friends, fun xmas memories, early Saturday mornings waking up to pancakes and cartoons, family trips, swimming pools - it doesn't matter what it was, just how it made you feel. Once you remember what made you joyful in the past as a child - then you can actually re-create it as an adult. You can recreate the entire picture if you have the means to do so - or you can just re-create the feeling it gave you. For instance - some of my most joyful memories center around my brief visits with my grandparents in Santa Monica, after we'd lived in Eugene, Oregon for a decade. Their house on Georgina was so light, so beautiful to me - the long, low stucco house was filled with family antiques as well as modern California touches - and most magically, they had a pool and a lovely patio with plants and ceramic pots that were always warmed by the sun. I remember that sound of small airplanes lazily passing by overhead, and to this day whenever I hear a small airplane I get that feeling again. That early-morning, two blocks from the beach kind of feeling. I don't actually have to BE in Santa Monica to get it - instead I find myself arranging certain family antiques in a similar fashion as they had, or I cook things that they cooked - well, vegan versions anyway - and I like to play music that came from their kitchen, while I cook those things - Benny Goodman, Tommy Dorsey, etc. Doinig this instantly transports me beyond my room, my house - like a time machine! It's especially strong around xmas time when I trim the tree and bake cookies and remember my grandparents amazing tree, and seemingly endless supply of xmas cookies. When a Rankin & Bass xmas special comes on I am practically delirious with a delicious nostalgia. Ahhhh, so satisfying, so beautiful! Other cherished memories I have stem from certain moments in our hippy years. When I lived in our house truck for three years in the 1970's I had many cozy moments that I think of often, and try to summon up in my present day life. Mostly they center around my mother's tiny-yet-richly-fragrant kitchen. Pretty blue tiles surrounded the house truck sink, a stained glass window looked over it, and there were blue glass ball jars of rice and grains, and green leafy plants curling about. The smells of the herbs and spices, the promise of a hearty dinner on a cold night, perhaps the sound of Joni Mitchell or Crosby, Stills, and Nash playing in the background - these impressions are carved deep in my heart, and give me a beautifully comforting vision to play in my mind, and bring into my present world. I have pretty jars of spices and herbs on my shelves, I have leafy green plants around my little stained glass window, and I play Joni Mitchell and CS&N all the time. So even though I can't really travel right now, I feel like I'm parked somewhere along the McKenzie river in the house truck, or hanging out in 1970's Santa Monica on 2nd street, or somewhere up in Topanga Canyon in some groovy house. And I don't even have to go anywhere! One other thing that really expands my little world, during the summertime - watering. I loooove to water. Everything. The plants, the grass, the trees, and even the weeds, poor things - everything gets a drink, every day. There is something about drenching every hot, dry, parched blade of grass or struggling flower makes my soul feel better. I feel I am painting the world with instant relief. I hate to think of the plants and animals being hot and thirsty, I hate to think of them suffering when I have the means to alleviate it. I keep a bowl of fresh water available 24-7 for the critters and it's really a joy to see all kinds of birds, squirrels, and cats drinking from it. I keep two hummingbird feeders full of clean, cool nectar that I make myself, and I put out seeds and nuts in several places. It's like a wildlife education seminar, just watching all the behavior around the water bowl! Since we got our amazing new fence that surrounds the entire house I have felt far more able to spend time in the front of the house. Before it was just too public, too intimidating with all that incredibly loud traffic and god knows who lurching up 50th - sometimes there are some seriously wasted people right outside our doors -, and it can be scary. But since we got our fence I feel so much safer, more relaxed, and actually able to walk around my house, enjoying the sunlight and sound of the birds, and watering everything in sight. Also, I've hung creamy outdoor curtains and clear outdoor lights on both sides of the house. When my menopausal self wakes up at 3am the world outside has finally taken its drunken self home and all is quiet for the moment. That's when I take my first cup of coffee outside and walk under the lights and curtains, around the house, admiring how the lights make the yellow paint glow and set off the little white gingerbread trim on the porch, At that hour my house and grounds look like something out of a children's book. A sweet, fairy tale cottage with cozy lights and pancakes inside. Ahhhhh, my world may be small, but it's huge - it's the past, the present, and partly the future - and it's radiant. The Best Tastes of Summer: Guilt-Free Ravioli! Hey friends! I just discovered a recipe that impressed me SO much, for so many reasons - that I had to share! First let me ask you a ridiculous question: do you like ravioli? Of course you do! It's almost like pizza, right? Something you could eat every day, but probably don't because it's loaded with unhealthy things and tons of calories, right? Well guess what?! NOW YOU CAN HAVE RAVIOLI EVERY DAY! Or whenever and however often you want!!! Because this recipe has absolutely nothing in it that isn't clean - well, ok, maybe the faux cheese has some oil in it, and I do use olive oil to lightly cook the spinach and garlic. But that is the worst of it - a little oil. NO dairy, NO meat, and hardly any calories - plus it tastes as good as the real thing? No joke! ZUCCHINI - our star player. These thin strips of zukes, when baked in tomato-y, garlic-y juices become almost exactly like noodles. TOFU, mashed - like ricotta. SPINACH AND GARLIC - superfoods, both. TOMATO SAUCE - I like chunky organic stuff from a jar, but you can make your own if you want it extra clean! DAIYA SHREDDED "CHEESE" - this stuff is so tasty and melts like a dream! I also like to include some BLACK OLIVES for some more deliciously salty texture. Using a vegetable peeler, peel zucchini into strips. In a large pan, heat olive oil over medium-high heat and then add the spinach. Cook until wilted. Add the garlic and sauté for one more minute, or until fragrant. Add the spinach-garlic mixture to the tofu, and stir to combine. Take two equal slices of zucchini and place one across the other to create a cross. Add 1-2 tablespoons of the tofu-spinach mixture to the center of the cross. Take one side of the bottom strip and fold over center. Take the other side of the bottom strip and fold over the other piece covering the center. Take one side of the top piece and fold over the center, and then fold the other side of the top piece and fold it over the other side covering the center, tucking in, if possible. Place the zucchini ravioli, seam side down, in a casserole dish and top with sauce and daiya cheese and olives, if using. Delicious, Festive, and Fun for the Kids! Here is our new favorite thing. Pressed-glass sugar cookies! How clever is this?! You make your regular sugar cookie and cut them out with a round cutter, then stamp them with the ends of your favorite juice glasses! Or, whatever has some kind of edge or molded shape on the bottom. You'd be surprised how pretty even the simplest little scallop, or dimple that's molded into the bottom of a glass with no intention of ever really being seen - looks stamped into a cookie! So cute, and so unexpected. And perfect for little hands to help with. A link to a delicious vegan sugar cookie recipe is here. Bon Appetit and have some delicious fun! Ahhhh, it's raining! Whoever thought we'd be starving for rain in Oregon?! But starving we are - it's like perpetual summer around here these days! But today....ahhhhhhh. It's not quite a downpour, but a good, steady rain for at least an hour now, turning into a consistent drizzle. Everything looks wet, smells good, and there are hardly any people on the street. With perpetual summer comes perpetual motorcycle engines, leaf blowers, bumping stereos and loud porch drinkers. Right now it's cool, calm and quiet, just the way I like it! These babies are full of flavor, texture, silky, cheesy smoothness and savory satisfaction, BUT - they have no dairy, no meat, no processed food of any kind! They are actually healthy chili cheese nachos! Serve em to your kids! Serve em to your footballers! They'll be so intent on the game they won't even notice they're healthy! Ingredients: 1/4 c raw cashews soaked for at least one hour. 1 1/4 c diced potatoes, heaping 1/3 c diced carrots, 2 - 3 Tbsp nutritional yeast, 2 Tbsp coconut oil, 2 Tbsp water, 1 1/2 tsp lemon juice, 1/2 tsp salt, 1 medium clove garlic, 1/2 - 3/4 tsp white wine vinegar, to taste. Directions: Simply boil the potatoes and carrots until tender, drain and put everything the blender, blending until smooth. Adjust consistency by adding tiny bit of water to taste. This stuff is SO GOOD! Ingredients: 1/2 package of morningstar griller crumbles, a double recipe (2 batches) of vegan cheese sauce, 2 c diced onion, 1 red bell pepper diced with juices, 1 Tbsp tomato paste, 14 oz diced tomatoes, 1 can red kidney beans, 1 can black beans, 3 cloves garlic, 1/2 c sliced black olives, 1 1/2 tsp apple cider vinegar, 1 Tbsp pchili powder, 1 tsp cumin, 1 tsp oregano. Directions: Sautee griller crumbles as directed, set aside. In a large skillet sautee onion and garlic until tender. Add beans and tomatoes and spices and sautee another ten minutes. Remove from heat. In a glass container, or large dip container, pour a layer of bean and tomato mixture, topped by a layer griller cumbles, a sparse layer of olives, and then a layer of cheese sauce, and continue layering until cheese is used up covering the top, saving 1/3 c of bean mixture for a "garnish", topped with olives. Place chips as desired. Serve. Enjoy! Don't you LOVE fall?! There must be something innately, biologically ingrained in us to love fall. When the air turns a little bit brisk after the dog days of summer, and we smell some wood smoke in the air, or there is a good, hard rain during the night and you wake up to that smell of soaked pine needles, and hear the crows happily cawing overhead, and you start thinking....pumpkins. Pie. Cashmere. BOOTS!!!!! It used to be that along with visions of coziness fall would bring its own load of stress. The words "'back-to-school" at first delighted me as a young parent - I enjoyed shopping for school supplies with Cora, and taking her to her early years at school, participating in events, making costumes, volunteering, packing lunches, etc. It was really fun, and really cute most of the time! But...as the tween years wane and the teen years wax...it is less fun. "School supplies" become exponentially more expensive as they grow older. They don't need college ruled paper and pencils anymore. They need expensive calculators and lap tops, apps and phone plans. And many pairs of expensive shoes. Yikes! But now, a fresh empty-nester - those three words hold no power over me. When I see huge ads for back-to-school sales I don't panic, I don't brace myself - I realize they aren't talking to me anymore. I am free to enjoy fall without pressure. Free to cook, make things, take walks and brighten the house. I'm so excited!!!!!!!! As you can tell I adore cooking. I wish food had no calories (don't we all) so that I could cook all the time and eat everything I cook. Instead I try to find the cleanest recipes I can so that I can enjoy making them and eat them without adverse consequences. Fall is an especially wonderful time to get into the kitchen, especially if you don't have to cook (and clean, ugh) for little ones. I had a great time baking that chocolate cake the other day, and I followed it up with the most amazing faux-chicken soup in the world. I'm including the recipe below. It is so flavorful, so lip-smackingly delicious, and so healthy I'm going to make it again as soon as possible. As long as it's easy, healthy and delicious, I'm in cooking-heaven. I don't even mind doing the dishes, when there aren't too many. And let me just add - as far as the holidays go (and I know this is controversial) - in my house it's never too early. 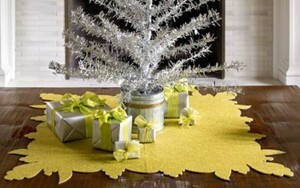 As long as its tasteful and in the appropriate doses, holiday decor can happen any old time after August. I'm not talking garish Halloween decor, unless it's simple pumpkins and soft lights - something beautiful. I do not care for the macabre, the ghoulish, the gory or the terrifying. I am a wimp, a wuss, an early-to-bed-Julie-Andrews kind of girl. But who isn't, really, deep down? It's possible to love scary Halloween and love cozy lanterns and candle light, cozy cottages with crackling firesides, spiced cider and harvest soup. I think it's impossible not to. That biologically-wired-to-love-fall thing I mentioned before. So that's what this fall is to me. Getting creative, cooking delicious food, and savoring every moment. Oh, and cashmere. It's always about cashmere. And boots. So Yum, So Easy! Refreshing, Healthy Summer Snackage! I love what is going on in the food world. So many lovely people creating new, healthy, beautiful recipes that delight the senses and the soul. I follow about fifty instagram accounts that dazzle me every day with their carefully-crafted food photography, inspiring me every day to try something new! And I'd have to say that about 99.9% of the time it comes out DELICIOUS! This time is no exception. The other day I made "Raw, Vegan, Sugar-Free Nice Cream Cake"! This bad boy had a chocolate macaroon base, a banana nice cream filling and a chocolate ganache top! With no sugar, no dairy, no preservatives, nothing bad at all in it. Plus, it lasted about three days, it is very satisfying, even filling, so you only want one piece at a time and are perfectly full and sated after that. A very handy snack to have on hand when the sugar cravings hit! Here is the delightful video on how to make the ice cream cake. When I was 19 years-old, living in my first apartment, my bed consisted of a broken-down futon laid over a bunch of plastic milk crates. No lie. My bookcases were cement blocks with wooden planks between them, and my rent was only 86.50 a month, for my half of the two bedroom place I shared with one of my best friends, Debbie. This was in 1985. Granted, it was a crap-hole apartment, down by the railroad tracks, so close that whenever a train went by, which was every hour or so, the entire place shook. We were also right next to a cannery that worked all night with forklifts going in and out of its giant doors, carrying thousands of silver cans, the contents of which we could guess by the smell in the air. It was either beets, or beans, or carrots. And they all smelled bad. Although we lived in such a humble abode, and I had no real furniture per se, I always took great care with my bed and bedding. Over the broken-down futon I would tenderly spread my very-clean, mismatched sheets, tucking them in and artfully arranging the various quilts and blankets I'd collected so that it looked comfy and cozy and welcoming at all times. Being a kind of sensitive person I have always valued a sanctuary. The rest of the apartment might be trashed, but my bedroom was clean and my bed always welcoming. The same could not be said through long the days of raising kids. The kids were actually IN my bed, so it was no sanctuary. That was ok because at the time I'd found a whole new kind of sanctuary with my baby. She was welcome in my private world - she became my private world. Until about age 11. When the attitude hit, mommy started needing a hiding place again. These days I still don't have an ideal situation - we have a two bedroom house, one of which my husband sleeps in, and the other is for my teenage daughter - but even though I sleep in the basement, my sanctuary is better than ever! My husband and I slept in the same bed for the first 15 years of our marriage, and then one day I realized that I had to get my own. I needed better sleep! I needed room to spread out, and our bed was cramped with both of us, and sometimes the dog. I'm almost 6 feet tall (and so is my husband), and a queen-sized bed just doesn't work. Add to that the fact my husband talks (loudly) in his sleep and I have back pain which makes me sleep in weird positions, and now these horrendous hot flashes...well, having our own beds is a must if we don't want to become stark, raving, sweating loonies. PLUS having your own bedroom space is fantastic for other reasons! I think it is highly underrated. No more stressing out about how badly he makes the bed, or how he leaves clothes all over the floor. It's in his room, not mine! Mine stays neat as a pin and feels calming every time I enter it, basement or no basement. It is a finished basement that I have made as cozy as possible, and until my 18 year old daughter moves out (this summer) and I can take her room, it works very well as a sanctuary. I have soft rugs down there, a comfortable couch, pretty lamps, and even though every now and then I see those shiny silver slug trails that tell of a nocturnal basement visitor, I have yet to see the actual culprit. I have hung sheer curtains around my bed, which is no longer a futon on milk crates, it's a Beauty Rest pillow top mattress that I would consider marrying if I wasn't already married. It is a dream mattress. I only buy over-300-thread count sheets now because I have very sensitive skin, and I wash them OFTEN. (I looooove clean sheet, one of the great joys of life! And very healing - even on Downton Abbey they talked about how important good food and clean sheets were to the wounded soldiers recuperating there.) The smell of my bedding after it's been lightly bleached, washed and dried is like a haven in itself. Instantly relaxing. And isn't that what a bed is all about? I recently purchased a new duvet cover and shams that have such a pretty print and tiny tassels at the edges, and new sheets so that crawling into bed at night with the curtains around me I feel like the princess that I deserve to be. We all deserve it! So my life-hack advice today is to spend time on your bed. Take care of it, Buy nice sheets. Make it a sanctuary for yourself to retreat to every night, or day. Or whenever you want. I read a quote somewhere once that said, "A made bed is a clean room". I think that is true literally and metaphorically. One could easily say "A made bed is a peaceful life". Snack-Attack: Quick, Clean, Kid-friendly, Fashion-friendly Muffins!!! We interrupt our regular programming to bring you this breaking recipe: Flourless, Vegan Blender Muffins!!! Delicious (this is very important to me, no matter how "clean" I'm cooking: it MUST taste delicious or I won't bother eating it, let alone sharing it. These little flavor bombs are lip-smackingly good - sweet, filling, and sweet-tooth satisfying, all without any sugar! Completely guilt-free. There is no dairy fat, no sugar, no flour even! They are only made of vegetables and fruit! A muffin of our dreams really, when you think about it, and the fact there is no flour makes them perfect for me. For some reason flour is like crack to me - even whole wheat! When I have a slice of bread, or a real muffin or a pancake...I just want more. Once I've had some form of bread I wake the bread dragon inside and I just can't stop eating it. And it almost immediately bloats me and makes me feel sluggish and heavy. Yuck! But these muffins: have no flour! So easy to make. They are SO easy, in fact, your kid could make them. With oven-supervision of course. But I mean, what could be easier than putting everything a blender and pushing a button?! It's fantastic! So if you've got a sweet potato, a couple of bananas and some almond butter in your cupboards - you're already there! Happy Baking, and eating! You'll find the original recipe here at superhealthykids.com. 6 Tablespoons aquafaba, or any egg-replacer for 2 eggs. Preheat the oven to 350°F. Grease (and line with baking parchment) a muffin tin. Bake sweet potato until tender (about an hour) and allow to cool, or use leftovers if you have them on hand. Place 3/4 cup mashed sweet potato along with all the remaining ingredients (except the baking powder) in a blender. (Make sure you measure the sweet potato as the texture will change if you add a different amount.) Blend on high until smooth. Add the baking powder and blend on low until just combined. Pour the batter into the muffin tin, filling each cup 3/4 of the way full. Bake in preheated oven for 18-20 minutes until a toothpick inserted in the center of a muffin comes out clean. Remove from oven and let sit for 20 minutes to fully set. Remove from baking papers and enjoy!!! I have to share this absolutely DELICIOUS salad and dressing I made last night! Introducing the vegan Cobb Salad. As hearty or even heartier than your usual turkey/egg/ham ensemble, this salad gives you all the protein, fiber, anti-oxydents, anti-inflammatory, blood-cleansing, skin-clearing, stomach-filling, sweet-n-savory combination you could possibly ask for! It's a teenager and a husband-pleaser too, which is sometimes a hard target to hit. But hit it we did, and that's why I have to share! The salad and the dressing is SO easy to make. Simply chop your romaine and fill a large bowl. Then line up your chopped ingredients side by side over the top, you'll be delighted how they totally cover it, and consequently fill each bowl with delicious chunks of avocado, nuggets of crunchy cashews, salty faux bacon, juicy tomatoes, creamy kidney beans, sweet corn, and all drizzled with the tantalizingly delicious dressing. Enough, I'm starting to get hungry again! ½ cup chopped tempeh bacon (70 g) I like to use Smart Bacon, it's so yum! ¼ cup agave syrup (84 g) (I have used honey, but that means it's not vegan, fyi). Place the lettuce in a large bowl and top with arranged rows of tomatoes, red beans, bacon, avocado, corn and cashews. To make the dressing, you simply combine all the ingredients in a blender until smooth. You can also whisk together all the ingredients in a small bowl. Serve the vegan Cobb salad immediately with the dressing. A whole new kind of spring bouquet! I found the recipe for these apple rose baked treats on the internet and they looked so simple I had to try them. Instant success! They really have a lot of visual impact for such an easy recipe, and you gotta' love that! Give them a try and surprise your friends and family. I'm going to serve them with a side of vanilla ice cream next time. So yum! Recipe here:) And here is the video on how to make them. No-Bake Almond Joy Granola Bars -- guilt free snacks for everyone! It's time for another heart-healthy, fashion-friendly recipe! I hate low blood sugar moments. For some reason I never (although at 48 years old you'd think I'd learn) recognize them for what they are, and for a minute or two, it suddenly feels as though the world is coming to an end. For a long painful moment I have that feeling of being totally overwhlemed and unable to handle what's in front of me....and then my stomach growls and I realize OH.That's right, DUH. I need to eat something. I'm ok, I'm great actually, the world is not coming to an end, I just need a banana. Or some almonds. Or a delicious, home-made, chemical-free, organic, vegan, tasty treat!!! Line an 8-inch or 9-inch square pan with two pieces of parchment paper, one going each way so it's easy to lift out. In a large bowl, stir together the oats, rice crisp cereal, sliced almonds, coconut, and chia seeds. In a medium pot over low heat, melt the coconut oil. Remove from heat and stir in the almond butter, coconut nectar, and vanilla, until smooth. Pour wet mixture over dry and stir well until thoroughly combined. Add a pinch of salt to taste and stir again. Spoon mixture into the pan and roughly spread out (but don't pack down yet). Sprinkle on the chocolate chips in an even layer. Wet hands lightly and then press down the mixture until even. Use a pastry roller to roll it out and pack it in even more. Transfer pan to the freezer for about 10 minutes until firm. Slice into bars, wrap, and store in the fridge or freezer. These bars fall apart easily so I don't recommend leaving them at room temperature for longer than a few minutes. Nutritional info: (based on 14 servings, per bar with chocolate chips): 193 cals, 12.6 grams fat, 16.5 grams carbs, 3.5 grams fibre, 5.8 grams sugar, 5 grams protein. Let's get this week off to the best possible start with a delicious, guilt-free, healthy breakfast! The kids will love these tasty muffins, too, and you'll all feel full of energy to start your day! These power-muffins are gluten-free, vegan, and honey-sweetened goodness! mix these dry ingredients with a fork or whisk in a medium-sized bowl. Add wet ingredients to dry ingredients, do not over mix, and fold in 1 cup of blueberries. If using frozen berries, do not thaw out before, keep frozen until you add to mixture. Spoon into greased muffin tin, bake for approx. 23-27 minutes or until a tester comes out clean. Let cool in the pan for 3 minutes before popping out onto a plate! Enjoy! It's time for a new, tantalizing, taste-bud satisfying, delicious, HEALTHY recipe! Beleive me, I would never dangle this picture of a rich, chocolate mousse if I didn't know it was good for you. I don't tempt the chocolate fates very often, it can be a slippery slope, but this particular recipe is a wonderful, guilt-free treat that I can't keep to myself. Plus, it's so easy to make you'll want to whip it up over and over again! Simply melt the choco chips and coconut oil for 30 seconds in a small bowl the microwave. Add orange zest and stir until smooth. Put package of tofu in the blender, add choco mix, cocoa powder and salt and blend until smooth. Use a rubber spatula to scrape the mixture into cups. Cover with plastic wrap or tinfoil and place in fridge. Let sit for at least two hours, remove and eat! Nice with a little orange zest on top for presentation. One of the top three things on our mind Christmas Eve and Christmas Day is: RELAXING. In fact, relaxing is so important during this time, that we'd be hard-pressed to choose between a great xmas gift, or the freedome and comfort to really relax. I love my leafy greens, but I must admit I've been looking for new ways to prepare them. As the season ripens, so does my appetite for more flavor, so I tried this recipe the other day, and FELL IN LOVE. Note: I traded out the bacon for fake bacon which was light, smokey, and HEALTHY. I mean, what's the point or eating spinach if you cover it in real bacon? I like the Smart Bacon product for crumbling into salads and scrambles, and for BLT's! Ok, I just made these totally healthy PANCAKES FROM THE GODS, and I feel like a million bucks! I will not lie -- I adore pancakes and syrup. Not the white flour, cakey, gut-bombs they serve at IHOP drowned in Aunt Jemima, No way, those kind make me feel actuely ill.
No,I'm talkin' 'bout the hearty, buckwheat, oat and organic blueberry kind, the kind of pancake that is only made with ingredients that nourish you and that have a little tooth to them so they fill you up with goodness! Serve them with almond butter and bananas, or my favorite -- a splash of the real maple syrup, the kind that comes out of trees! Need a chocolate fix, but don't want the fat? I made these the other day for my daughter Cora and fell in love with them myself. The recipe is for freezing it in pop-form, which is delicious, but my favorite is the chilled custard version...DELISH!!! No dairy in these! -- In a sauce pan combine sugar or syrups , cocoa powder, cornstarch, and salt. Add milk and bring ot a boil over medium stirring constantly for five to seven minutes. Remove from heat as soon it thickens. Stir in the butter until melted. Add the vanilla, refrigerate for ten minutes until cool but not thickened. Stir in the marshmallows. Pour into pop molds, or ramekins for custard. Freeze pops for at least 8 hours, or chill custard in the fridge for two hours. Heaven. In celebration of Earth Day, here is a deliciously healthy, plant-based recipe for you and your family to enjoy. The perfect spring and summer dish that will surely wow 'em at a pot luck...it's a man-pleaser, too! In food processor, or hand-dice, to mix chicken, onions and walnuts. Add 1/3 cup of poppy seed dressing, process only until mixed. In small bowl, mix remaining dressing and the cream cheese, spread with spoon until smooth. Spread cream cheese mixture evenly over entire surface of tortillas. Remove white rib from the lettuce leaves. Press lettuce into the cream cheese, tearing to fit, and leaving top two inches of tortillas uncovered. Spread chicken mixture over lettuce. Sprinkle strawberries over chicken. Firmly roll up tortillas, beginning at bottom. Wrap each roll in plastic wrap. Refrigerate at least one hour. Trim ends of each roll. Cut rolls into 1/2-3/4 inch slices. Arrange on plate and serve! YUM! Is there anything more cheerful than a paper valentine? We got crafty here at Melange and made a few sweet little hearts ourselves. Now our little boutique blooms with the love we feel every day for our friends and customers! Enjoy this at home too! No matter where you live a hanging paper heart or collection of hearts will add a little artful love and creative cheer to your life! We're trying to keep to a mainly plant-based diet these days, because all the science says it's the best way to avoid disease, and feel great (and look great too!). So, in keeping with that focus, I am THRILLED to have found what I call the "Tu-no Salad Sandwich", which gives me the fresh, savory taste of a tuna salad sandwich, without any meat. Healthy, sustainable, low-cal, delicious and filling, this sandwich is a great way to get your veggies! Enjoy! In a large bowl, combine the parsnip, celery and onion. Zest, then halve the lemon. Add the lemon zest and juice from on ehalf to the parsnip mixture, along with the mayonnaise, relish, yeast, and salt, stirring to comine. Spread on a slice of bread, top with another slice and serve! Or, use only one piece of bread and serve as an open face with a fresh slice of tomato on top! Brrrrrrr!!! It was snowing this morning in Oregon! So beautiful-- millions of big, soft flakes falling in front of dark green pine trees, I absolutely love it! But it made me long for a hot bowl of soup, or better yet, STEW!!! After all, it's January 10th, the middle of winter, what could possibly hit the spot better than a delicious, hearty bowl of beef stew? Not healthy, you say? Well, not so! I happen to have the most amazing recipe for a healthy, hearty, lip-smackingly good beef stew that's low in calories...and...VEGAN!!! And with absolutely no loss of taste, whatsoever! This one is a man-pleaser...I'll bet that if you don't tell your family it's not real beef, they will NEVER guess! 12 oz vegan beef strips or chunks, I love the Gardein ones, available in most grocery stores! First, prep your beef. Thaw it, and/or saute it so it's warm. Then, In a medium bowl, combine the flour, rosemary, salt, and pepper. Add the beef and toss to coat. Heat the oil in a 4-6 quart stockpot over medium heat. Add the beef mixture and cook, sitrring occasionally, for 5 minutes. Add the garlic and cook, stirring occasionally, for 1 minute. Stir in the stock, wine, and carrots. Increase the heat to high , bring to a boil, and reduce to a simmer. Cook for 15 minutes, stirring occasionally. Add the potato and onion and cook, stirring occasionally, for 15 minutes. Add the mushrooms and cook, stirring occasionally, for 15 minutes. Add the peas, stirring until the peas are heated through. Serve with a hunk of whole grain bread and this delicious butter-spread, and watch the smiles spread over your loved-ones faces!!! We're a HUGE fan of vintage everything.From Victorian to Deco, Art-Nouveau to Modernist Mid-Century, we're hooked. But the key to really making your vintage collections chic and not shabby, cool and not cluttered, is to use it sparingly, or put a collection together so it works as one large statement element. Now, I hang some of those same ornaments on my tree, though I skip the flocking, and my tree stand does not revolve. The beautiful old things still glint magically next to the little white lights every year, and still cheerfully bring the christmas spirit to life. "O Tannenbaum, o Tannenbaum,You give us so much pleasure! You give us so much pleasure! " Could these homemade fabric wreath really rock the runway? I went straight to Fabric Depot, and spotted some beautiful ivory polyesther silk (cheaper than the real thing! ), and a champagne-colored satin, and then a super-super-cheap bolt of light, almost sheer muslin.The kind of fresh white cotton muslin they used to make petticoats and chemises out of! It's only like 1.99 a yard, so I got two. (remember, I was making five wreaths, for one, you'd only need a little. I went to a craft store then and bought yellow straw wreath forms. (Do not take off the plastic shrink wrap, it will keep the straw tight and tidy, and is great for pinning!) I bought four smaller ones of 12" and one large one of 16". I took the fabrics home and figured out how long a piece needed to be in order to wrap around the wreath arm. Each piece of fabric you cut will be this length, which is about 12". Then, I decided to put the cheapest fabric on the bottom because I would use the most of that, so that was the muslin, and I cut out several pieces of muslin 12" x 6". The next layer would be the satin because I wanted to save the most luxurious, shimmering fabric (the silk) for the top. So I cut pieces of the satin 12" x 5". Then I cut pieces of the silk 12" x 4". And layered them big, next smaller, smallest. Sew down the middle of each pile of strips with a basting stitch. Then, take the string at the end of your basting stitch, and gently gather, wiggling it a bit as it creates the ruffle. Be careful not to pull too hard and break your string! It takes about 7 piles of the 3 ffabrics to cover the smaller wreaths, and about 12 for the large. When all the pieces are in place you can pin a length of gross-grain ribbon for it to hang from! So beautiful, and if I do say so, so chic! Stay tuned for a matching fabric garland! I know it's almost Halloween, but my thoughts are already on christmas! To be honest, Halloween was never my favorite holiday, I'm the type who favors twinkly white lights and cozy corners over scary masks and spooky faces. Also, I always wish I'd started holiday crafts earlier, so this year I decided to skip Halloween altogether and decorate for fall, winter, and yes, christmas, instead. I have discovered a paper craft that is SO EASY, and so inexpensive I HAVE to share with all of you so if you want to get started early, too. These beautiful paper stars are so easy the kids can make them, even the husband could make them, (althoug h I gave mine a beer as added incentive.) They must be cool, too because I put one on my 14 year-old's door as a surprise, and she loved it! I made these stars out of nothing but printer paper and gluestick, so they were practically free, but of course you can make them out of any paper you choose. I think some origami paper would be perfectly adorable, and would work for different events -- birthdays, anniversaries,bridal showers, Easter....stars for every occasion! Click the link above for instructions. Once you make a few, you'll be off and running, and fair warning, it will be hard to stop! Ooooh, it's already a fabulous day! We have started up our own little Tumblr blog, and you are invited to view it, experience it, and follow it! On Tumblr we'll be regularly posting photos of fashion of course, both our own and that from the world at large, sharing inspirational stories, quotes, recipes and ideas, and continuing on in our search for the perfectly curated, fabulous lifestyle! Oh, Things Just Keep Gettin' Better! Ladies and Gents, do yourself a fabulous fashion favor and rewatch episodes 1, 2, and 3 of the makeover show "Queer Eye for the Straight Guy"! This show more than stands the test of time, it is CHOCK FULL of great information for anyone wanting to take their lifestyle to the next level. Gay, straight, man or woman, the fab 5 can teach anyone great skills in home decor, personal grooming, food preparation and presentation, music and FASHION!!! So fun, and hilarious, the guys never stop cracking me up. This show is so great, it's positively therapeutic to watch! One of the best things about the holidays are the beautiful lights that decorate our homes and our streets! If the days have to be shorter, at least we can warm up the dark with glowing candles and strings of colorful bulbs. This year I took the plunge and headed into my local craft store with a list of materials needed for these wonderful Copper Candle Lanterns. Before I got started I worried they would be difficult to make, but I'm sharing them today because they are sooo easy!!! a few sheets of copper foil: which can be challenging to find. I found mine at Joanne's Fabrics, in the etching section. Ask at the counter where that is. They had copper and silver foil. I prefer the copper because it creates such a warm, rosy light. an awl: or a sharp punching too. Every craft box should have an awl, sometimes it's the only tool that will do! to make: lay out your copper foil and using the ruler and pencil, lightly mark out the size of the candle lantern you want. I made small ones, medium sized and one large. Using the scissors cut out the shape of the lanterns and spread flat on the table. Using pencil and ruler again mark out the designs you would like to punch out of the copper. Basic designs are best, I tried to make a punched-out impression of a castle, and it was too busy to work well. With your awl (and a little cardboard backing) simply punch small holes in the shape of your design. Using the hole punch at the top and bottom of the lantern allows for more light to escape and adds to the sparkle factor. Very pretty! To close and fasten: simply roll piece into a tube for lantern, punch two holes on edges with hole punch, insert brads into each hole and fasten. Voila! Put over tea lights and enjoy!!!! Thought I would share my Happy New Year craftie project. Well, actually, it was my Merry Christmas project too. I made a bunch of these for the holidays and gave them to friends as a gift for all sorts of things (Merry Christmas, Happy New Year, thank you, etc.) I think they turned out so cute, and I have to say, after a few weeks of being infused with the cranberries, the vodka was pretty darn yummy. I found a recipe that walked me thru it and it was super easy (just google infused vodka, there are a million different recipes). I just mixed a little sugar, with fresh cranberries, then heated them until the cranberries were about to burst, put them into the bottle with a funnel, added vodka, and put a stopper on it. Done. I designed the label myself (after buying labels from onlinelabels.com--they have a software that helps you print your design on whatever size labels you ordered). I bought the bottles online, and what you can't see, which is super cute, is that each bottle is a different translucent color---yellow, green, blue, red, with contrasting stopper colors. You can find bottles easily and very inexpensively...and the stoppers I found at a cooking store and will work with most bottles with small openings like this (they were made by Rabitt, the wine accessory company). Presto....instant gift! I spent a lot of time pondering this yesterday so I thought I would share. Delegation, I've always known, is one of the most important things in management...you've got to learn to be able to let go of things at the appropriate time and pass on that task in order to free yourself up. I'm pretty darn good at it by now, there isn't much I won't or can't pass on to the right person. Part of being able to do that is letting go of the concept that you are the only person who should or CAN do something. You've got to realize that most things you do can be done by someone else just fine and that you in fact are not solo in your talents and/or abilities. So...that part I get perfectly fine, in the WORK setting. The hard part for me is taking that concept and translating it somehow to the home. I of course, was realizing this as I was running the 4 million different errands and "things" necessary to make Thanksgiving work (and the next two weeks when we will at some point have a new infant). There is part of me that unconsciously "shelters" my husband from a lot of stuff and I think this is common to a lot of women (although what started me thinking was my girlfriend who on Monday was explaining how she doesn't shelter her husband). By "sheltering" I guess I mean that I do a lot of the multi-tasking, house-organizing, and mentally-draining coordinating that is necessary to keep the ball rolling because I think to myself, "he works so hard, he is such a great father, blah, blah, blah." Part of it is also probably because I want to be able to do it all...or think I "should" be able to do it all.... work, run the kids around, run the household. So there are certain things I just do without even thinking about it, simply because I want to make it easier for other people I love (him and others). That is a nice theory, as long as you aren't killing yourself in the process, which I am. I guess this is where letting go comes in and delegating. I've got to accept that it is o.k. to ask for help, and o.k. to burden someone else who is already working hard because I'm in the same position, so my only choice is to kill myself trying to accomplish it all, or share the responsibility and we can both semi-kill ourselves. I also have to let go of the concept that I'm the only one who can do the house stuff....I might be the only one between the two of us with the multi-tasking and aforethought skills :-), but I'm definitely not the only one who can run to Cosco for toilet paper and lightbulbs. Anyway, I think I'm probaby particularly bad at this, but I know at least some other women need to "check" themselves and start delegating too because I see them running themselves ragged. Like I said, others out there, like my dear girlfriend, have a different response...."I just ask" (she is a stay at home mom--which I think would be make it even harder to ask sometimes because you feel like it is your "job" to do all of it). I know if I ask I'll get help (from my husband and any other number of people in my life), and there would be no attitude about it, so it really is silly not to just unburden myself a tad and delegate some of the mania away...hopefully bringing just a tad more peace into my life. So now that I'm an old married lady, ;) I have started to concentrate on making an honest effort to really fix up our tiny (but stylish!) apartment. I do love putting together rooms... and often think less is SO much more. I try my hardest to put a limit on clutter (with the exception of my one very messy craft closet) and put an emphasis things that we really love, i.e. photos, plants, cooking etc. With thanksgiving right around the corner and a growing number of out-of-town guests on their way to Eugene... I'm excited to clean and get the place looking spiffy. I've started on the opposite wall from the front door and I'm making a clean sweep of all closets, cabinets, and under-the-bed hiding places. Nothing has felt better in weeks... just looking at my sweaters in a neat, color-coordinated stack makes me smile. Is that dorky? But honestly, I love finding new things to inspire my inner design maven (she lives in all of us, you just have to find her). My latest being this beautiful orange blog shared with me by one of my best gal pals. It's just one picture after another of drool-worthy design ideas, and not just for the home. Sparks will definitely fly as you browse. For instance, not that I'll need a nursery any time soon... but when I'm lucky enough to have a sweet little one on the way, this is the nursery that would be on the top of my wish list. 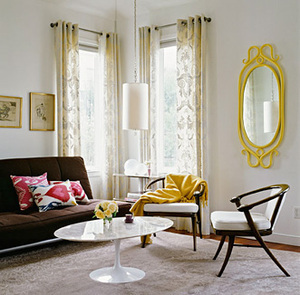 I really dig bits of yellow in a room... yellow has a good energy to it. I have some old yellow wooden letters found in a NC outerbanks antique store that spell out "SUN Y" missing a "N" but I love it all the same. So....I go to the grocery store yesterday....the regular grocery store, not gourmet, or high end, we are talking an Albertson's--generic all the way. I went for Tylenol for Lulu who had a fever, and that was my main objective. To get to the pharmacy I had to walk by a variety of other things and along the way I picked up a handful of things, among which was one of those small paper bags full of apples with the little paper handles. There was a coupon stuck on the handle for $1 off when you bought the whole bag. I thought, "sure, healthy bag of apples, that is always good, and a coupon too--cool." We are in Oregon, the apple capital of the nation (I might be making this up, but we do grow a LOT of apples here), and it is prime apple season. I had literally a handful of things, and I got through the checkout, Ava in tow, and the total bill is $42. I walk out of the store (successfully dodging the begging for candy at the checkout and the request for the enormous stuffed toy also strategically placed at the checkout). As I am walking out I start thinking, "yikes, how did that bill get to $42--seems high." One glance at my bill and I see a large charge of $23.79 for apples. FOR APPLES!!! I swear to you there could not have been more than 8-9 large apples in that bag. Holiday lists will save you! Many of you know that I've been obsessively organizing for months. Well, as it would turn out, I'm pretty freakin' organized by now and ready for the baby AND the holidays (yes, there are in fact wrapped gifts already stacked and ready to go in my office.) What I can tell you though, is that it feels FAN-TAS-TIC. So, to prode my fellow gals to the path of organized enlightment, I want to share a short list of the LISTS that you should get going on PRONTO so you too can enjoy an under-whelmed state of being this holiday season. :-) This is only helpful for those people like me that normally can't (or don't) even think about the holidays until AFTER Thanksgiving, and by then it is too late, chaos is bound to ensue because there is just not enough time! You want to have a little zen in your holiday and this is the only way to achieve it (well, short of loads of therapy) :-)! 1) Holiday Outfits: Jot down your events, parties and holiday gatherings and what you have to wear in your closet now and what you might need. If you are going to be slaving away making Thanksgiving dinner, you might as well be doing it in style! This is the time of year you see everyone that you haven't seen all year and you better look fantastic. 2) Gifts: This is a daunting task for most of us, but start one list for friends, one for family and one for "other". On the "other" list I put people like the teachers at school, Ava's piano teacher, the nanny. All those people that you know you will in fact have to buy something for and it will be loads easier to just have them done now. My method of attack was all the "obligatory" type gifts first...ie, the relatives you hate to buy for but you must, the teachers etc. So now, I pretty much only have fun gifts left to buy and the short list of people I enjoy buying for will actually be a fun holiday thing to do later for a little "spirit". Also, make sure your hostess stash of gifts is up to par because you ALWAYS need stuff to take places...someone also always shows up with a gift you didn't know was coming so having something for emergencies is smart. 3) Holiday cards: Get them ordered, it feels great to know that you will be timely for once. Yes, I even addressed mine early. At this point by the time you actually get them, it won't even be that early. www.invitingsmiles.com and www.tinyprints.com were both places I ordered from this year and was happy with. 4) Holiday tickets and events: Get your calendar in order, and buy any tickets you need to. Things go fast....the Nutcracker, Polar Express etc., all sell out unbelievable early so just book now and get your schedule in order. Every year before this one :-), I would scrabble to organize things late in the game and you get the worst seats, and most aggravation. Or worse...no seats and serious disappointment. Saved in the nick of time by an Egg Nog Latte!